Jewish Home chief presses PM to recognize Havat Gilad outpost in Samaria as full-fledged town, after resident murder yards away from home. Education Minister Naftali Bennett (Jewish Home) pressed Prime Minister Binyamin Netanyahu Sunday to normalize the status of an outpost town in Samaria which was the scene of a deadly terror shooting earlier this month. On January 9th, Arab terrorists gunned down Rabbi Raziel Shevach, a 32-year-old father of six from Havat Gilad. Rabbi Shevach was murdered just a few hundred yards from his home in Havat Gilad, a town which was established in 2002 by veteran settlement activist Moshe Zar, a year after his son, Gilad, was murdered on the same site in another terror attack. Since its establishment, the status of Havat Gilad has been disputed, labelled by the Sharon and Olmert governments as an “illegal outpost”, and subjected to multiple evacuations. Following the murder, however, Defense Minister Avigdor Liberman (Yisrael Beytenu) ordered the ministry to investigate the possibility of normalizing the community’s status and establishing it as a recognized township within the Samaria Regional Council. Last week, following the completion of his ministry’s review of the issue, Liberman submitted a proposal calling for a government decision establishing a new town in Samaria to house Havat Gilad’s residents – legalizing part of the existing town, while apparent requiring some residents living on contested land to relocate. The proposal gained the backing of a number of coalition members, who called on the Prime Minister to support normalizing Havat Gilad’s status. While Prime Minister Binyamin Netanyahu ordered the Defense Ministry to connect the Havat Gilad community in Samaria to Israel’s national electricity grid, plans to recognize the town were conspicuously absent from the agenda of the coalition’s weekly meeting Sunday. During the meeting of coalition leaders Sunday, Bennett raised the issue, pressing the Prime Minister to back efforts to normalize Havat Gilad’s status. 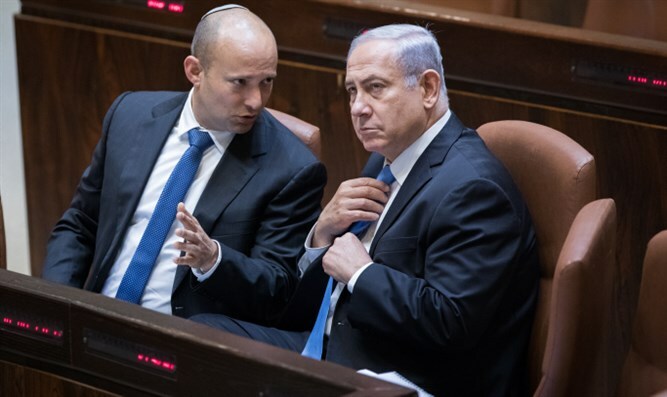 When the premier answered that he endorsed “connecting Havat Gilad to [Israel’s national] water and electricity networks,” Bennett replied that such moves were insufficient. Bennett noted that the town was located on private land purchased by Jews from Palestinian Authority residents.